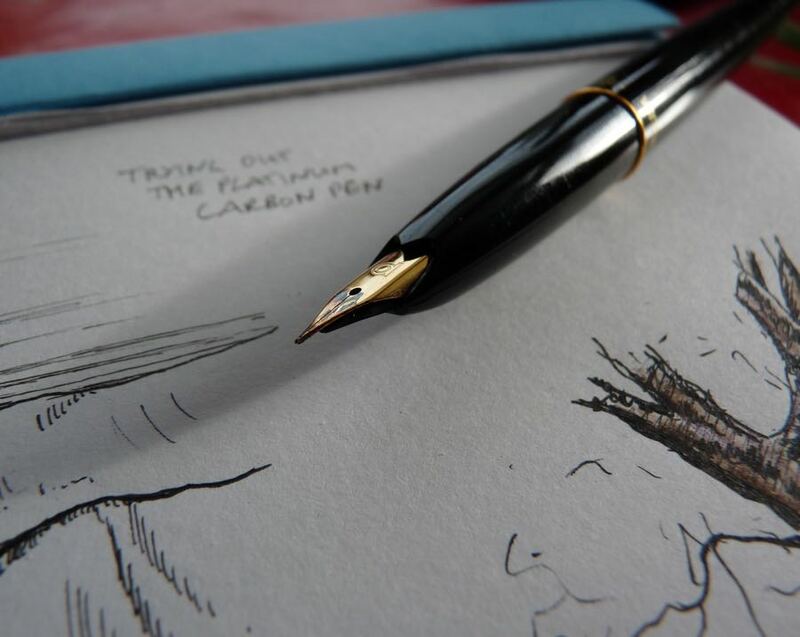 Platinum Carbon Pen – Sketch and Review – Pens! Paper! Pencils! 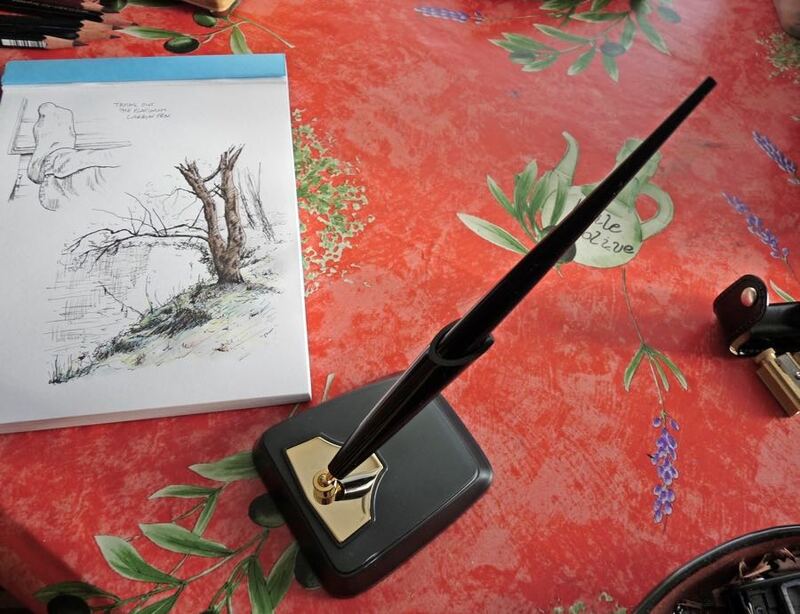 The Platinum Carbon Pen is a bit of a legend amongst artists, being recommended by, for example, one of my personal artistic heroes Marc Taro Holmes. Therefore I’m doing something a little different with this review and looking at this pen is for sketching. If you’re wanting to know what it’s like to write with then fear not for United Inkdom will soon be publishing a meta-review (of which this here is but one small part). Cult Pens kindly sent me this pen so I could review it. These are my honest opinions. The Platinum Carbon Pen has been designed to use Platinum’s Carbon Ink, which is a pigment ink, meaning it is very black and also waterproof. 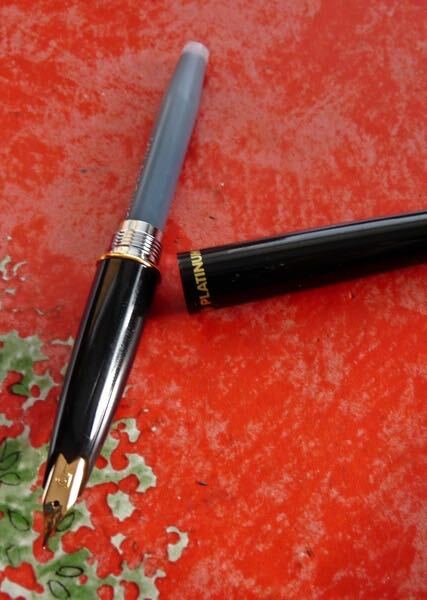 Cleaning waterproof ink out of a normal fountain pen can sometimes be a little tricky and it’s essential to avoid it drying out. I don’t know what Platinum have done differently with this pen but, at the very least, having something dedicated to an ink like this is a sensible precaution. The picture here was coloured using watercolour pencils and I was quite liberal with the water. As you can see, the ink is indeed black and waterproof. The pen is very long, rather like the awful Rotring Art Pen, so there must be someone somewhere who thinks this is what an arty pen should be like. Perhaps it’s to make it look like a brush? It doesn’t help or hinder artistic impression as far as I’m concerned but if you know of a good reason for this design please let me know. Importantly, despite being long, it’s made of plastic and so is very light. The cap is a strange and very ugly big of plastic with a hexagonal collar, which stops the pen rolling away. 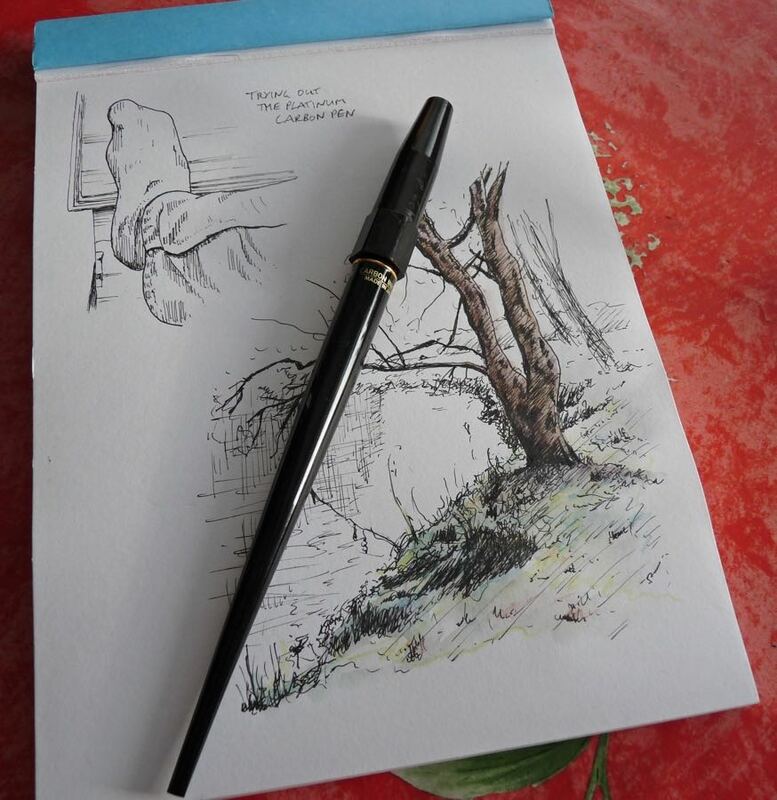 It doesn’t post and so if you put the pen down without capping it, which to be honest you’re going to do quite often if you’re sketching, it’s going to wander off anyway. The cap is clearly just a temporary solution until you get the desk stand. The desk stand is nicely weighted and the sleeve’s angle is adjustable. The nib is very fine but is nice and wet and consistent. The last thing you want when you’re sketching is a load of hard starts and you don’t get them with this pen. There is a the tiniest bit of line variation but I wouldn’t use it if you want lots of that kind of thing: use a fude nib instead. The variation you can get is nice here and there, though, for adding a bit of interest to your lines. I hadn’t been expecting to enjoy sketching with this pen as much as I do. I’ve been more than happy with my Sailor Fude pens (having bought a second recently) but they don’t give such a fine line reliably. It really is fun to draw with this nib. I could see myself using this often except that I do most of my pen and ink drawing whilst out and about and this is too long for me to conveniently carry around, not with the setup I currently have. Instead, it’s going to live on my desk, in its stand, and perhaps encourage me to do a little more with ink when I’m at home. Why are the pens so long? So you can cut them off, Ian. And then you can post them too 🙂 I carry this pen in my pocket all the time. I think I may just have to do this! Thanks for sharing! I couldn’t find anything about why desk pens are long, though. Richard Binder says it’s for balance and appearance, but I read that as though Binder couldn’t find anything about why they’re long either. 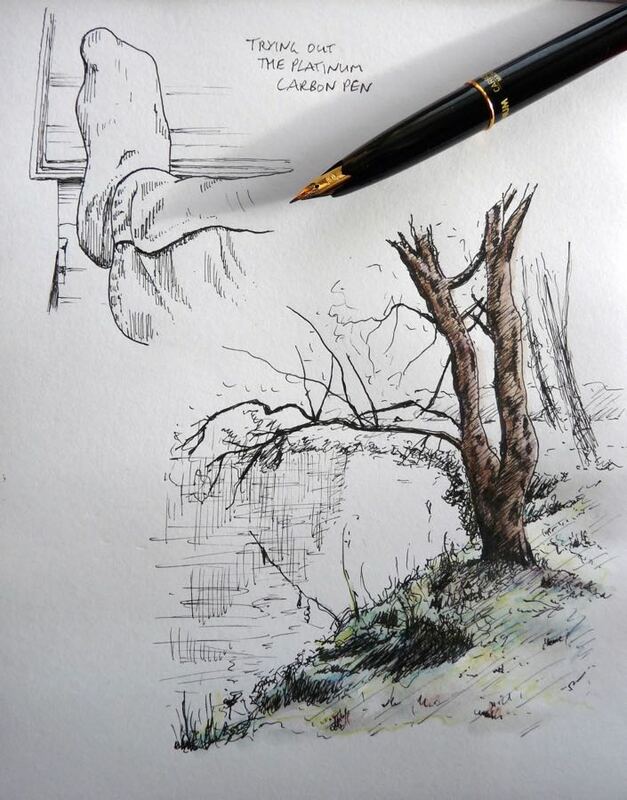 I was going to suggest cutting it too, it seems to be a common workaround for making the pen part of a pocket sketching kit! I’ve left mine full size, although I don’t do much with it, shamefully. (I tend to ink using Uni-Pin markers, or a Pentel Brush pen). My Carbon Pen doesn’t mind other inks, incidentally – it currently has a cartridge of purple in it, from a Preppy that stubbornly refuses to write. 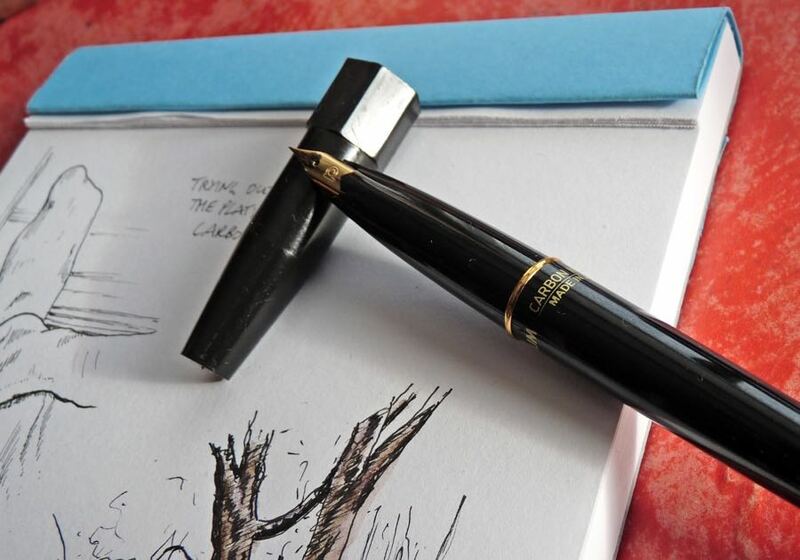 I wonder whether platinum have ever considered making a version with a standard pen body and cap – I think they’d do quite well! Essential guidance, there, I think. Good idea as this is, cutting the pen short, I couldn’t bring myself to do that to my pen. So, with them being cheap (particularly with Cult Pens giving 20% off at the moment), I bought a second one and shortened that one. I know this doesn’t really make any sense but it’s how my brain works. Now I have an unblemished pen on my desk and a vandalised one that fits in my pocket.